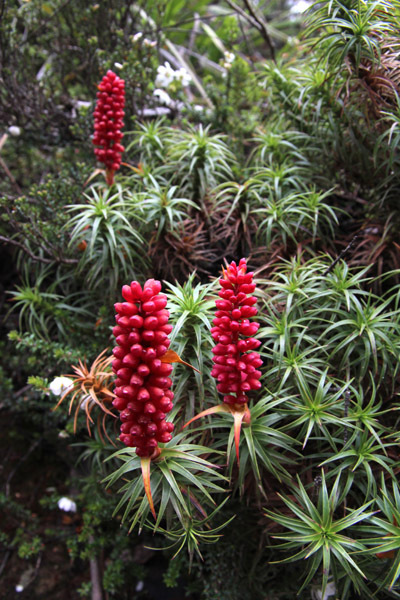 These pictures of Richea scoparia - known locally as 'Honey Bush' - were taken yesterday, on New Year's Eve, on Mount Field in Tasmania, at about 1100m.. 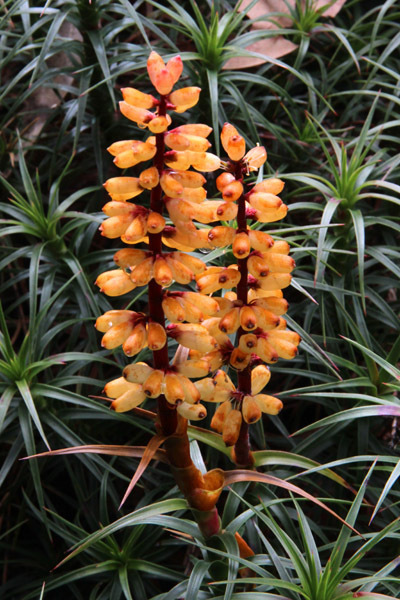 It was a shrub of about 50cm high, though according to the AGS Encyclopaedia it can grow up to 3m. Very spiky,and therefore not popular with walkers. 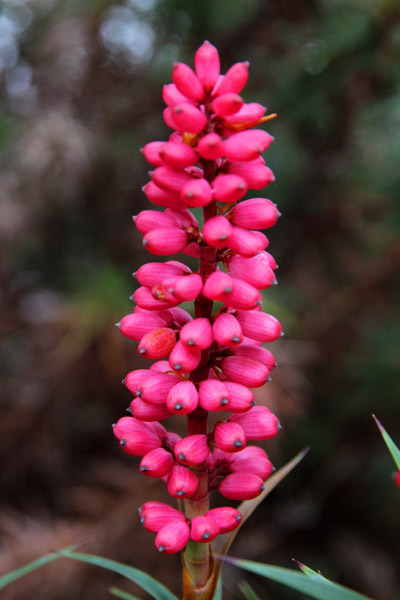 It is a Tasmanian endemic, being widespread among the mountains of the island. Its colour can vary from deep red to pink, maturing to yellow-brown. The reproductive parts of the flowers are hidden inside the secure capsules formed by fused petals, as can be seen in the closeups above. This protects them from the elements, but raises a problem with pollination. The solution to this lies with a small reptile, the snow skink (Niveoscincus micro-lepidotus), which in the summer feeds almost exclusively on nectar from R. scoparia. The skinks tear open the mature capsules, which they identify as having the most nectar, and thus allow pollinating insects access to the reproductive parts of the flowers, and allow the seeds to escape later. Richeas are named for Claude Riche (1762-97), a French naturalist who sailed in 1791 with D'Entrecasteaux on an expedition to find the famous French explorer La Perouse, who had disappeared on a round the world voyage.They did not find La Perouse (who had actually been lost on the reefs of the South Pacific island of Vanikoro), but Riche came back with a large number of botanical specimens.